From Chris Kimble: Doc Copper over the past few months has been hit hard, as sellers drove it down nearly 25%. This decline brought it to the price point (2), where four different support lines came into play, which looks like a support cluster. As the decline was taking place, momentum was hitting oversold levels. Joe Friday Just The Facts Ma’am– This week Doc Copper is experiencing its strongest rally this year, as it breaks above steep falling resistance. 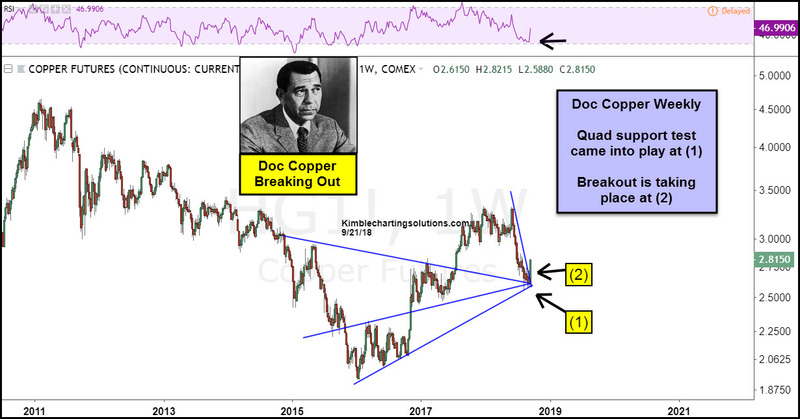 Should Doc Copper continue to push higher, its possible that it is sending a positive to some hard-hit global sectors. The iPath Series B Bloomberg Copper Subindex Total Return ETN (JJCB) closed at $43.80 on Friday, up $1.19 (+2.79%). Year-to-date, JJCB has declined -12.78%, versus a 9.86% rise in the benchmark S&P 500 index during the same period. JJCB currently has an ETF Daily News SMART Grade of NR (Not Rated), and is unranked among 109 ETFs in the Commodity ETFs category.